Data centers are always prone to I/O bottlenecks, which is why companies are always trying to scale network connections. Fiber optics have been around since the early 1980s, when telephone companies demonstrated their potential to transmit data at a higher velocity speed than that of copper. The problem back then is the same problem of today; fiber optic cabling is a costly upgrade to your infrastructure. Copper is much cheaper by comparison and works just fine for data transmission so long as your router isn’t too far away from your computer or dedicated server. Determined not to compensate speed for the sake of saving some moeny, Data centers on a budget devised a simple deployment plan: Use copper wire for short distances between one port to another and fiber optics where longer connections need to be made. Technicians would then scale accordingly, yet transitioning from 10 Gbps to 100Gbps while keeping costs down has been tough. Recent advancements in fiber optic technology is going to make the Data Center run faster and hopefully cheaper. In order to increase bandwidth speed, data centers must deploy multiple transceivers. Problem is, they are power hungry and relatively large that it’s hard to fit them within a single rack-spacing. This ultimately increases price to the consumer, who is expecting a faster internet connection at a lower cost. Industry experts suggest that silicon phonic chips be installed inside an optical transceiver. 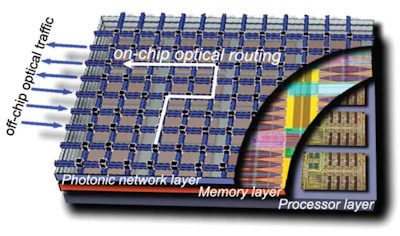 Mechanically speaking, Photonic chips are superior to other electrical counterparts. The are able to reflect light from various channels that are running on different frequencies. Each of these channels can run on a single strain of fiber optic cable, hence increasing it’s efficiency, while maintaining data transfer speed. The diagram above depicts single flow-path. Optical interconnects built with photonics are still being developed, though they are capable of providing faster interconnections between hardware while consuming less energy. As R&D progresses, Silicon Photonics will surely find their way into the data center and possibly, into our consumer electronics. We say, the sooner the better. Faster connectivity at a cheaper price is what people demand.